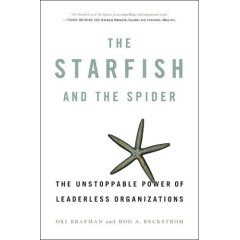 The book The Starfish and the Spider, by Brafman and Beckstrom, is awesome. It is a serious look at decentralized organizations versus centralized ones. It is a compelling message that needs to be heard today by everyone. I am, of course, in the spiritual world of the church, and to be honest, we should be leading the way in a decentralized movement. These two authors articulate well, with many profound examples, how powerful we can be if we choose to decentralize rather than keep everything organized around a CEO/Board of directors/Pastor. For those who are invested in God's kingdom, you must read this book. We should all be connected to the Head, that is Jesus, and He shouldbe leading a decentralized movement to the ends of the earth, but often we control what we have no business taking responsibility for. It has been a while. I am probably not going to be one of those regular bloggers. But as long as I don't fel like a failure when weeks go past without an update, I can continue with this. I finished my next book! It is going to be published by Baker Books. I am too close to it now to be able to tell if it is any good. I hope it is. I have been hard at work on it, which might explain some of my absence from this blog. My Lakers are in the playoffs, but not expected to go very far. But there is always hope!